Beam Center is busy everyday working with youth, teaching teachers and creating inspiring projects that make learning meaningful and fun! Scroll down for updates and follow us on Facebook or Instagram for cool photos, video and action from Beam day to day. We appreciate everyone who helps make our work possible. Check out our Beam Is campaign and hear from Beam youth what makes Beam special. Please consider supporting our work with students, schools and communities by making a donation. Check all the details on our Inventgenuity Festival page. This year’s event is FREE but please pre-register! For more resources or to download white paper, see Reclaiming Digital Futures website. Help Build the First NYC Beam Project! Donate to Challenge from March 18 to April 12! Beam Center and the NYC Beam Fellows are bringing our Giant Flipbooks to DUMBO this Summer! The NYC Beam Fellows, students ages 15-18, are not only building spectacular public art, they are building community and showcasing what young people can do. They'll work with local elementary and middle school students to trace and color the 200 Flipbook images needed to bring the animation to life. 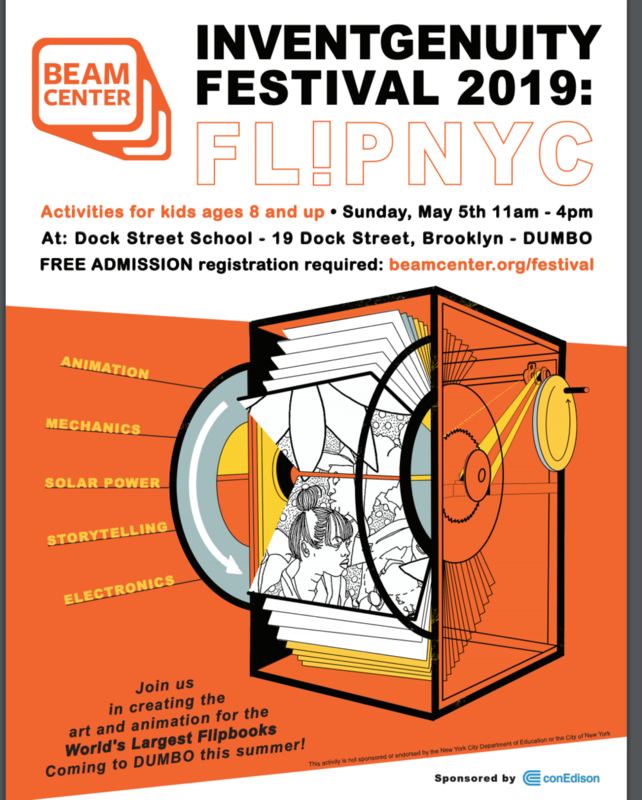 FlipNYC is a collaboration between Beam Center, the NYC Beam Fellows, architect Chee-Kit Lai, artist Ebony Bolt, hundreds of community illustrators and you. Help Beam build FlipNYC and win prize money - up to $50,000! Beam Center has been selected to be part of A Community Thrives - Crowdrise Challenge by the USA TODAY Network to raise money for this effort. The Campaign runs from March 18 to Friday April, 12 at midnight. The top teams can win grand prize cash donations up to $50,000! We keep every dollar we raise, but must raise $6,000 to be eligible. The sooner we reach $6,000, the more prizes we can win! Please help us reach this goal with a donation! Your donations will support this FREE program by contributing to design and engineering fees, community workshops, materials, and staffing. Thank you! ANNOUNCING: For our 15th Summer at Beam Camp, we are proud to present the 23rd Beam Camp project! Iceberg by Designers Lucie Bulot and Dylan Collins was selected from close to 50 international submissions and is inventive, technical, fun, and relevant to today’s headlines. Our project team, which included campers for the first time, reviewed countless pages of submissions and spent hours interviewing project designer candidates. Beam Camp Registration is still open to New Campers and Returning Campers, though spots are extremely limited. More information at Beam Camp website. Beam was honored to be a 2018 Grantee of BRIC Media Share! Working with BRIC mentor Sean Mannion, Project Development Director Allen Riley and Operations & Finance Manager Kathryn Wallem produced, shot, and edited the story of two of Beam’s Youth Project Leaders, Reji and ZP, who design and teach creative, hands-on STEAM lessons at CAMBA after-school programs at PS 114 in Canarsie, Brooklyn. We are so proud! Watch Beam Center Apprentices in action! We are so proud that Beam was highlighted in this video about the CareerCLUE program, supported by NYC DOE, NYC Community and Renewal Schools and the Fund for Public Schools. 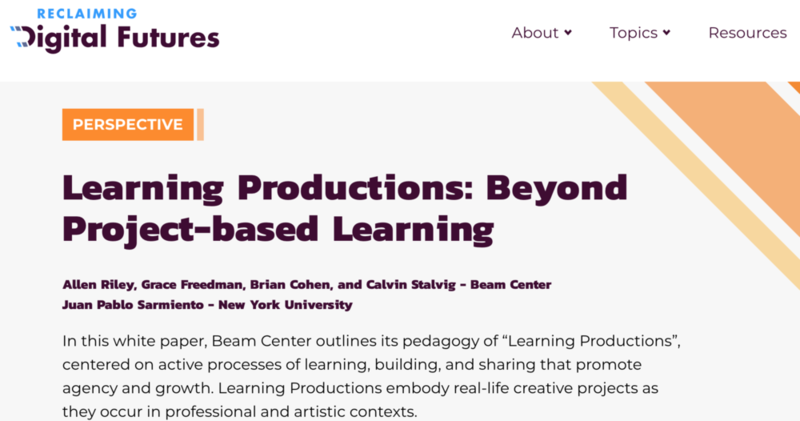 Hear from our students and teachers about learning and making at Beam. Call for Beam Camp 2019 Project Proposals! Submit your proposal to make this year’s project the best yet! Please share with your friends, colleagues and networks! See detailed proposal instructions here. For inspiration, check out Beam projects from the last 14 years here! Bread & Brawn Video Release! We asked young people we work with in NYC and at Beam Camp to tell us their Beam story and answer the question “What is Beam?” Here are just a few things they said. What is Beam to you? Watch and share our video stories on Beam’s YouTube channel and join us in telling your “Beam is” story. Beam supporters, staff and youth gathered to CELEBRATE investment in youth as part of the 2018 Youth Inc Celebration Gala. As a first-time honoree, you helped us smash expectations and together we raised close to $100,000 to benefit Beam youth programs. After we hit $75,000, we announced a stretch goal to direct all additional money raised to benefit the NYC Beam Project coming in June 2019. (You can still donate to the campaign until December 14, 2018.) Thank you for your support! Join us to support Beam youth! This fall, Beam Center is one of 10 NYC youth nonprofits to be honored at the annual Youth Inc Celebration Gala held on November 14, 2018 at The Grand Hyatt New York. We are proud to be recognized for our work with youth and all monies we raise will be directed to youth programs. We would love for you to attend or consider a sponsorship. More details about the event and how you can support Beam with a ticket purchase or donation here. Thanks to Todd Bookman from New Hampshire Public Radio (NHPR) for visiting Beam as we were completing the Bread & Brawn project. He was able to capture some of the crazy but inspiring (and delicious) stuff that happens at Beam. Listen to Beam Campers describe the work here. This summer, Beam Center is firing on all cylinders with programs in 7 locations across NYC plus our sleepaway camp in New Hampshire. We are creating exciting projects with young people at Brooklyn Summer Day Camp, Teen Apprenticeship at Beam Center and Beam's Invention X Nature program for STEM Summer in the City in schools in each borough. More details from our NYC summer programs here. Campers constructed a monument to myth, memory and meaning, employing skills of welding, coding, storytelling with lots and lots of concrete. More details here. As we wrap up the school year, it’s incredible to see Beam youth and instructors working in and out of the classroom. We are thrilled to celebrate all the amazing projects created by Beam youth during our in-school partnerships this year. We are amazed and proud that we worked with over 5,000 public school students this year in 25 NYC schools! Kudos to students from Fannie Lou Hamer Freedom High School who won Crowd Favorite Award at Emoticon 2018 for the LoveYrslf Floating Flowers, Brooklyn International High School students who participated in the NYC Sustainability Showcase with Interactive Raspberry Pi Recycling Bins and Beam Instructor Christopher Yau who was named ConEdison’s Brooklyn Yankee Kid! Also, students from Bronx International High School created their own hydroponic garden with Beam instructors and were featured on News12 in the Bronx. PLUS over $3,000+ raised for Day Camp Scholarships! Thanks to ConEdison for support for the Festival and Beam Center's work in Brooklyn FabLab schools! More photos and fun here. Announcing Beam Camp Projects 2018! We're thrilled to announce the projects for Beam Camp NH 2018! This year's international design competition netted over 50 submissions, from which we have selected two incredible projects. Join us this summer to build big and dream big! Check out Beam Camp in New Hampshire for more details. Beam Youth Leader Recognized as SuperStar! Calvin Stalvig, Director of the BeamWorks Apprentice program and Youth Development Leader, was awarded 1st place in the Algorhythm SuperStar Youth Development Awards! This past spring and summer, over 90% of Beam Apprentices had statistically significant socio-emotional learning gains due to participation in our program. Calvin was key in helping youth gain self-confidence, develop team-building skills and increase their positive identity. We are thrilled that Calvin and Beam Center were recognized for our work with youth! This summer, high school Apprentices learned about NYC water ecology, developed STEM lessons which they taught to younger children and took field trips to explore and discover NYC's waterways. Thanks for your reflections on MAKING Memories of 2017. We are deeply grateful for the thoughtful and strenuous collaboration of the all the kids, teens, teachers, staff and guest artists who have made incredible projects with us this year. MAKE A MOMENT was the theme of our year-end campaign. We were proud to highlight our youth, artists and projects. Thank you for all your support! Your donations exceeded our goals and help us make a difference for NYC youth in 2018! An intergalactic salvage station struck by a meteor, a solar-powered cinematic riff on a French film from 1902, a 2-story arboreal kaleidoscope: every year, Beam Camp solicits proposals for unique and spectacular large-scale projects that serve as the centerpiece for a 25-day session of camp, during which they are built and brought to life by 100 campers and staff. Deadline for submissions is January 7, 2018. We had a great summer with hundreds of kids in New Hampshire. We were thrilled to be profiled by Todd Bookman of NH Public Radio, by The Weather Channel and by two Beamers as part of their independent projects. Great photos of the Kinetic Cluster and Salvage Station No. 8! We had our biggest Apprenticeship summer yet working with over 80 teenagers in three locations (one in Brooklyn and two in the Bronx). Two groups created “Watershed” a rolling educational cart with games designed to teach younger children about water ecology, while another group created a “Solar-powered Satellite Dish” that communicated with plants! The Brooklyn teens took the Watershed to several local playgrounds in Red Hook, engaging younger kids in learning about science and the environment. Teens also explored NYC waterways by going canoeing on Newtown Creek and taking a trip to the Rockaways! It was the first time many of the teens either rode a canoe or swam at the New York beach. On June 3rd, we celebrated our 1st Beam Block Party, showcasing the work of our students from 23 public schools all over NYC! Thanks to parents, teens and special guests who stopped by. Learn more and see photos here. Beam Center was selected as one of 8 nationwide programs to participate in the Susan Crown Exchange Challenge with an accompanying award of $100,000. We are proud to be recognized as an exemplary program using digital tools for learning and serving youth ages 13-18 in out-of-school settings. Each program focuses on skill growth by working with youth to create and connect hands-on learning experiences to life, work and play beyond the program. Read more here.